Denmark's leading pre-hospital partner for virtualization of health services. Viewcare is Denmark’s leading telecommunications company for the Pre-hospital area. 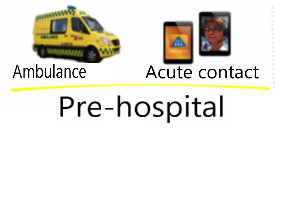 Viewcare offers solutions for ambulances, emergency units and emergency rostering. Read more about Viewcare’s solutions for Pre-hospitals. From mobile or fixed devices, doctors can watch live video directly from the backroom - also when the ambulance is driving. The doctor has the opportunity to adapt and adjust the camera angle and zoom, allowing for high medical quality already in the ambulance. Volunteer emergency assistants in local communities, islands or far from the nearest ambulance receive direct help and guidance from emergency staff, through the tablet and smartphone, and can start treatment until the emergency response arrives. Video can be a very effective means of communication - also at the medical officer. Directly from a browser or with an app on a tablet or smartphone, citizens seeking medical help can be served via video.